A collection of News Articles and Press Releases from Devon for Europe. We are always on the hunt for contributions, if you have anything to share, please contact us. The large cohort of Devon for Europe supporters who had made the trip up to London to be part of the demonstration and rally outside Parliament, were overjoyed last night (Tuesday) as the big screens outside Parliament displayed the live feed of the massive defeat inflicted in the ‘Meaningful Vote’ on Theresa May’s Withdrawal Agreement. This historic moment was the culmination of the ‘Decision Day Live’ event, staged by the People’s Vote Campaign. Speakers included MPs from all parties, bar the DUP, and representatives of youth groups and the NHS. 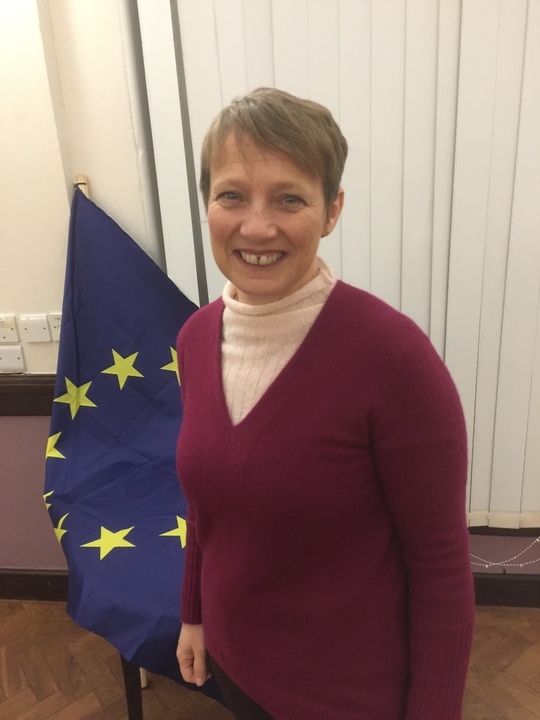 Anthea Simmons, of Devon for Europe, spoke on behalf of grassroots campaigners across the UK who have transformed the People’s Vote ambition into the powerful political proposition that it is today. “It is now crystal clear that the Brexit promised in 2016 will not, and can not be delivered. The government have well and truly botched Brexit, and this view is shared by many, whether they voted leave or remain last time. The only acceptable and democratic outcome is to ask the British people if they really wish to leave the EU and, once the vote of no confidence is over, we can expect MPs from across the political spectrum to rally behind a People’s Vote as their only way out of this mess’. A Channel 4-commissioned Survation poll, the largest independent survey since the Referendum of 2016, showed that 54% of people in the UK, 53% in the South West, would now choose to remain in the EU. “The case for a People’s Vote is now irrefutable. Twenty eight months on, people are realising that the Brexit that was promised to them is simply not deliverable. Devon for Europe is much heartened by this shift in opinion but recognises that there is more to do. We’ve been working hard on the streets to explain why we are better, stronger and more able to tackle the issues that led to Brexit if we remain members of the EU. It’s great to see this change of heart, but our task is not done. We need to secure our democratic right to vote on whatever form of Brexit Theresa May brings back (which almost all politicians now agree will harm the economy) or to remain in the EU and retain the great deal we already have. We can then take up our rightful role in helping to reform and develop the EU - itself the greatest peace project of our times - whilst rebuilding the UK and investing in its people. Determined Devonians from all over the county set out early on Saturday, the 23rd of June, to join the March for a People's Vote, ending up in Parliament Square in Westminster. 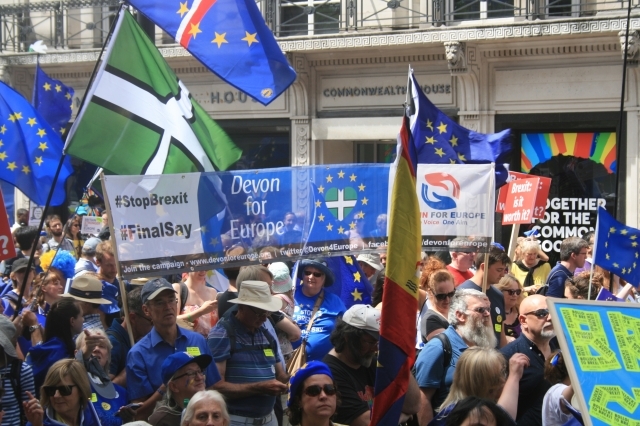 Organised by Devon for Europe, five coaches left from Plymouth, Exeter, Honiton and Totnes, and met up with hundreds of other local supporters travelling by other means. They were marching because they felt they had no other way to show how desperately they care about the UK and its future prospects. 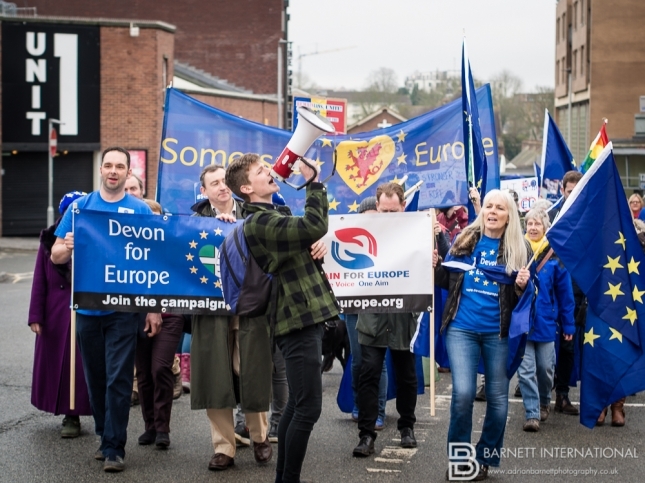 The Devon contingent of well over 750 then joined the quarter of a million plus marchers (some calculations put the figure closer to 500,000) on their way to Parliament Square, making this the largest pro EU march to date by a very big margin. 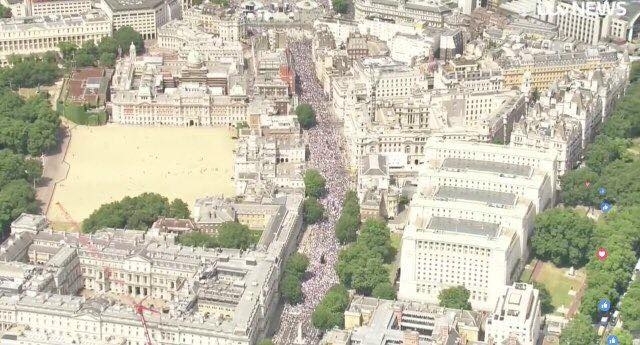 Aerial footage showed the positive, peaceful protestors filling the whole of Pall Mall, Whitehall and Westminster. “Every age here today all with the same passion. Save this country from Brexit! Make this government acknowledge us as voters!” said Jenny Stoneman from Torquay. In front of the mother of parliaments, the attentive crowd listened to inspiring speeches from, amongst others, Vince Cable, leader of the Liberal Democrats, Caroline Lucas co-Leader of the Green Party, Anna Soubry, a prominent and passionate ‘rebel’ from the Conservative party and David Lammy, who speaks out against Brexit from within the Labour Party. All spoke powerfully in support of a People’s Vote, drawing roars of approval from the crowd as they championed truth and democracy. The rally also saw the launch of a new petition demanding a People’s Vote, which attracted over 60,000 signatures in the first few hours of going live, and will be presented to Parliament later in the year. 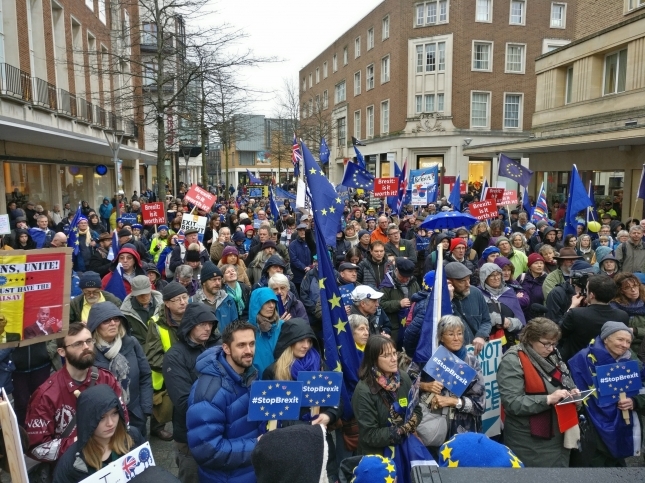 Two Thousand Five Hundred People March and Attend Rally in Exeter City Centre on Saturday. Ben Bradshaw tells activists from all over the South West that Brexit is turning out to be a serious mistake for our country and that the British public must be given a say on the terms of any deal. 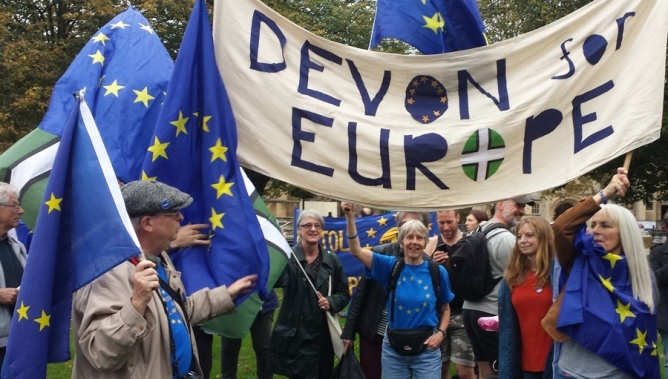 Remain campaigners came from the tip of Cornwall to Bristol, from Cheltenham to Bournemouth to join a march and rally for Europe organised by local organisation, Devon for Europe. 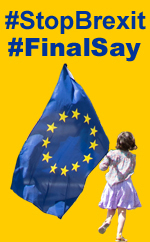 The marchers, waving their EU flags and #StopBrexit and #FinalSay placards wound their way along Exeter’s streets from Belmont Park to the rally venue, Princesshay, in the centre of Exeter, there to hear speeches by MPs, MEPs and many others. The speeches by MPs and MEPs were interspersed by speakers representing local youth, university, farming and councillors. There were also speeches from Thomas Haynes, from Labour Youth and Sam Campling, Chair of Devon and Cornwall Young Liberal Democrats. “Each time a promise cannot be fulfilled the Brextremists blame our EU friends, driving us further apart and making a tolerable Brexit less likely. It is becoming clearer by the day that Brexit is all pain for no gain. We must resist; leaving the EU is not a done deal. “This rally will demonstrate the strength of opposition to the government’s extreme Brexit plans and will serve as a reminder that our democracy allows us to change our minds. We must have another chance to consider the future of this country. Julie Girling, who was elected as a Conservative, but now sits as an Independent, was the next MEP to speak. She made it plain that she wanted to stay in the EU as it would be better for Britain. She said that many Conservative MPs agreed with her. Devon councillors from many parties, including Martin Shaw, Jacqi Hodgson, Martin Wrigley, Emma Brennan also shared the stage to voice their concerns for the impact on the NHS, the environment and jobs. Emma gave a rousing and much appreciated rendition of “Who do you think you’re kidding Mrs May” to the Dad’s Army theme tune. Those present also heard the stories of those whose lives are already impacted or threatened by Brexit, including farmers and non-UK EU citizens presently living in stressful limbo. Cheryl Cottle Hunkin and Margaret Boyde were able to give an Anti-Brexit farming perspective. Cheryl reminded the rally that the NFU had advised its members to vote in favour of remaining in the EU. She feared a non-agreement, resulting in sky-high WTO tariffs, for example 59% on the export of beef to the EU. Added customs checks mean more red tape would be created- not less. Margaret, who had farmed for a considerable period in France, added that farmers need to be anxious about their support payments, as it was only guaranteed until 2020. Amongst her many other worries was the possibility of US food coming to Britain, having been raised with much lower welfare standards, so resulting in “chlorinated chicken” being imported. Of freedom, is stronger than the truth of unity. Alex Pilkington, Chair of Devon for Europe, said, “With the government’s own impact assessments showing unprecedented damage to the economy, the prospect of further de-funding of the NHS and with heightened tension with Russia and Trump’s tariff war, more and more people are coming to the conclusion that Brexit will be very bad for Britain. The South West is set to pay a heavy price. As a region we have the highest percentage of exports to the EU compared to the rest of the UK. We firmly believe that democracy is an ongoing process and that in a democracy people must be given the right to change their minds. Especially now that the promises of the Leave campaign have been shown to be empty and false. The British people must have a final say on the negotiated Brexit deal, with the option to remain in the EU”. 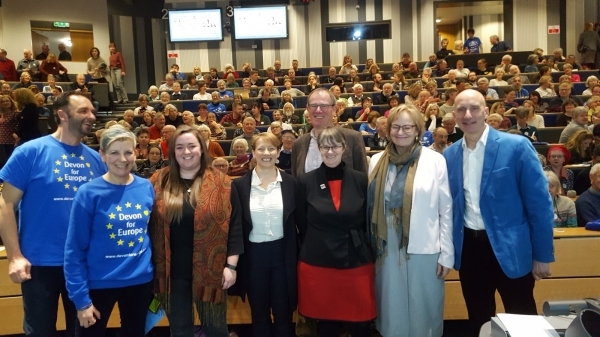 Members of Devon for Europe travelled up to Westminster to join 500 attendees at the pro-EU conference organised by Britain for Europe on behalf of Britain for Europe, European Movement, Scientists for EU and Healthier IN in the EU. Speakers at the conference stressed that an exit without a deal was a disastrous outcome for the UK. Current negotiations are deadlocked and Brexit is in a mess. Many members took time to personally meet their MPs and bring to their attention concerns about the current state of Brexit. Cheryl Cottle-Hunkin, a farmers daughter, met her MP Geoffrey Cox eager to discuss the effects of Brexit upon agriculture and the challenges that the farming community faced as a result of Brexit. 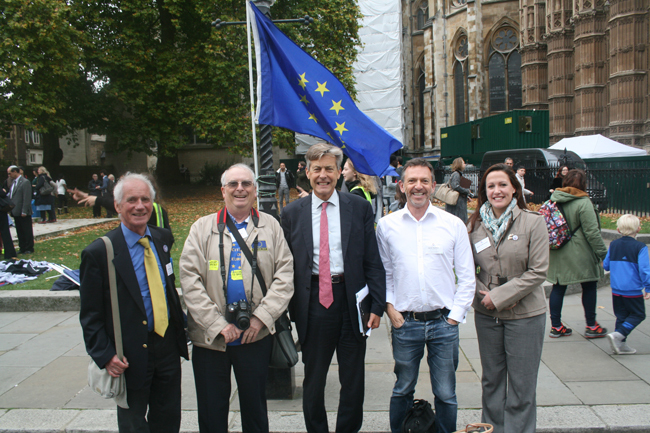 Ben Bradshaw met a delegation outside the Houses of Parliament where a vibrant anti-Brexit demonstration was taking place. Ben was especially interested in the effects on industry. Exeter sent 70% of its exports to the EU in 2014, whilst the South West has the highest percentage of exports to the EU of all UK regions. 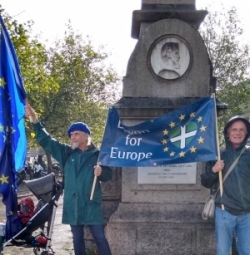 Strong winds and driving rain could not stop members of Devon for Europe from waving the flags for both the EU and Devon at the Wills monument in Totnes on Saturday 21st October. Car horns tooted in support, people stopped to congratulate the brave souls, and some even joined in flying the flags high into the wind. Devon for Europe is a local branch of over 700 members campaigning to keep the UK in the European Union. It is a cross party organisation actively collaborating with other groups in the South West, and affiliated to Britain for Europe. Members of the group will be travelling to Westminster on Tuesday 24th October to lobby Devon MPs and attend a pro-EU conference. 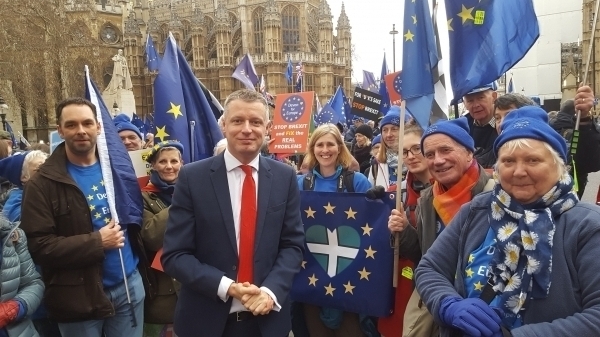 A rally organised by anti-Brexit campaigners still fighting to keep the UK in the EU, was held in Totnes on the anniversary of the Brexit referendum. Around 35 people joined hands and waved EU flags in the rally in the town’s civic square organised by the Devon for Europe group. 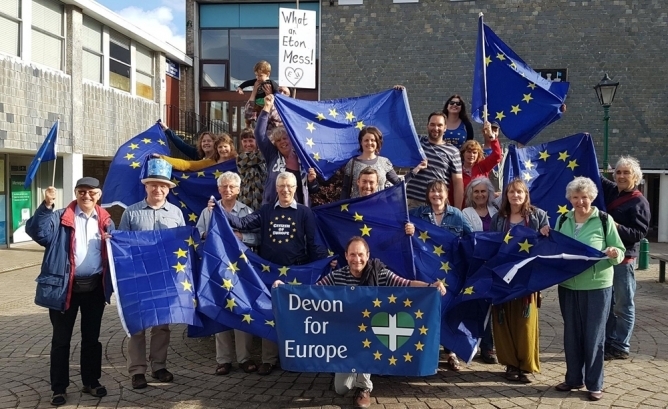 The group is campaigning to stay in the EU, holds regular street stalls and meets monthly in Totnes and other Devon towns. In March this year, the group held an anti-Brexit vigil in the square to mark the triggering of Article 50 to take the UK out of the EU. 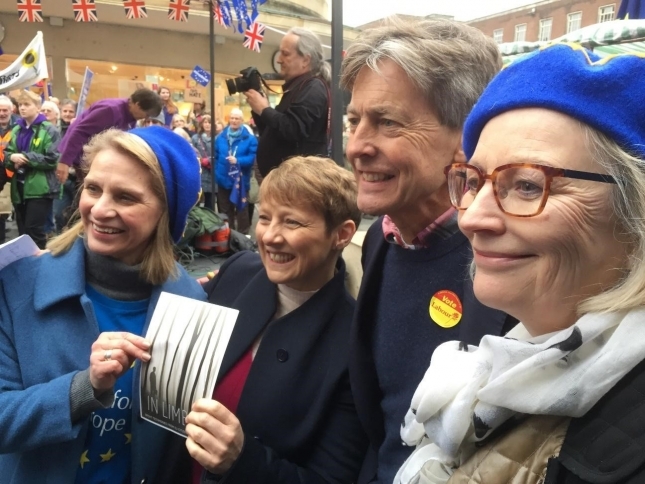 Mr Pilkington said: “On our street stalls we have certainly noticed a marked shift in peoples attitude toward Brexit since the general election, the result of which has given them more hope, and is encouraging them to join us in ever greater numbers.